If you have any kind of problems regarding our services, you can leave a message with all the queries. But, if you are facing some of the most common issues, or have some common queries, the answers to such queries are given here. Does my car have to be damaged, wrecked, totaled, junk in order to qualify for a car cash program? No. In fact, we pick up many used ‘cars for cash’ that are perfectly in tact. At Sell The Cars, we will negotiate a fair price for your vehicle on the phone prior to coming to your location. There is no need to make any commitment until we have agreed upon a price that works for you. This way, you will know exactly what to expect before we come out to pay you and pick up your vehicle for free. Unfortunately, there are scammers out there that can take advantage of your situation. You should be aware of them and we understand your concern. That’s why we put money in your hand at the time we pick up your vehicle. We are bonded and insured so no games, no worries. Just a straightforward, car for cash (check) transaction! Will SellTheCars come to my city? We pickup all cars in any city in the United States. Just submit your request for a quote by clicking on the ‘Get a Quote Now’ button or call us today at CALL 1 (800) 561-8615 . What if I want to sell my truck online? You can still sell your car or truck online – that is your choice. However, most sellers end up calling us after they have paid hefty fees to list their vehicle online and have failed to sell. We want to help make your life easier and save you those wasted dollars. We recommend you give us a call to see how much you can get for your vehicle before you try listing it. You may be pleasantly surprised at how much we offer! My car is completely totaled… Will you still take it? We specialize in helping you get rid of your damaged car, wrecked, junk and totaled cars. 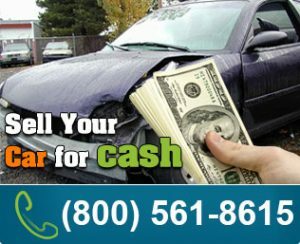 Call us today at CALL 1 (800) 561-8615 or click on Get a Quote Now to see how much cash you could get for your totaled vehicle. If you have some other questions, feel free to contact us, and we will give our best to help you.